There are many signs to the coming of spring. Here at Shiloh it is usually the appearance of spring flowers, ground bees buzzing, and wildlife returning, both human and non. One of the sure signs that happen each year around this time for several days is the appearance of cedar waxwings. These playful birds often travel in large groups. Here at the museum, one or two waxwings arrive first and are followed shortly by larger numbers. In the springtime, they pick at the blossoms of our hackberry trees; in the fall, they will return for a feast of holly berries. These “ninjas,” as one staff member called them, silently appear and make their presence known with their calls. 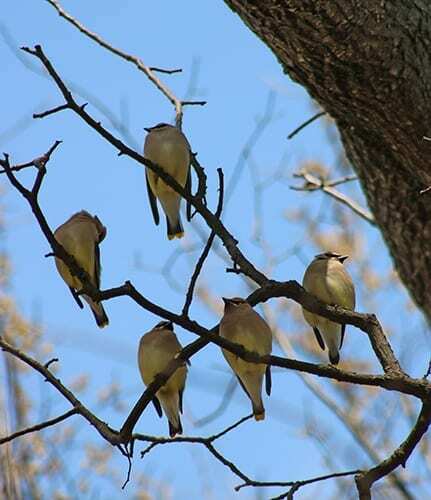 Cedar waxwings have two calls. One is a high-pitched, trilled “bzeee” and the other a sighing whistle. Visit Cornell’s Lab of Ornithology for audio clips of each call. 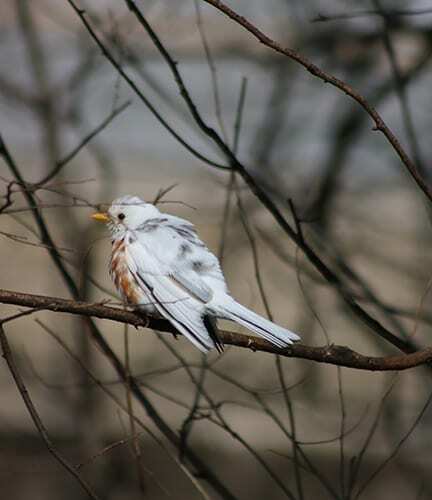 Another wildlife sign of spring is the occasional glimpse of a leucistic American robin. Leucism is from the German leucimus, which is from the Greek leukόs for “clear, white.” It is caused by reduced pigmentation which causes pale color or patches of reduced coloring. Unlike albinism which is caused by a lack of melanin, leucism inhibits melanin and other pigments as well. Adjacent to Spring Creek and right on the Razorback Regional Greenway, our museum campus is a great spot for a nature walk. Bring the family, but please remember to respect the flora and fauna that call this little downtown oasis home. Aaron Loehndorf is the Shiloh Museum’s collections and education specialist.